This will adjust the audio path from the computer to the radio. 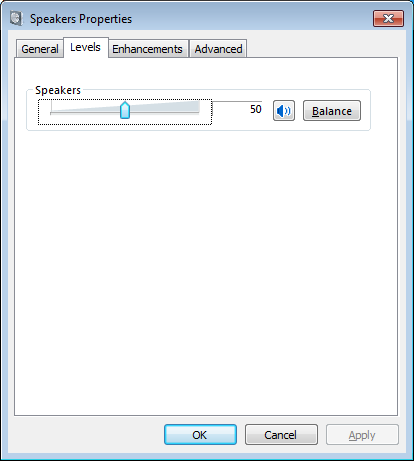 Begin by setting any external volume controls on the interface at half, if applicable. If Control Panel is in Category mode, first click Hardware and Sound. If the radio interface device (USB Audio CODEC for SignaLink) has a green check next to it, this indicates it is the default audio device. 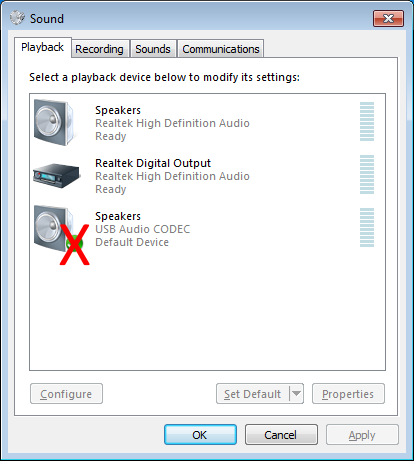 DO NOT use the radio interface as the default Windows audio device. Any sounds generated by the computer will be transmitted including system sounds, music, and screensaver noises. The radio interface will be selected in the settings of the digital application. When traveling once, some station had the radio interface set as the default audio device. The aquarium screensaver was not only transmitting bubbles but tying up a local repeater. Don’t be that guy. 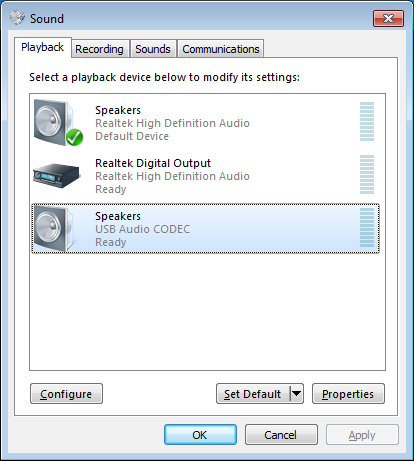 Set the sound card as the default audio device. 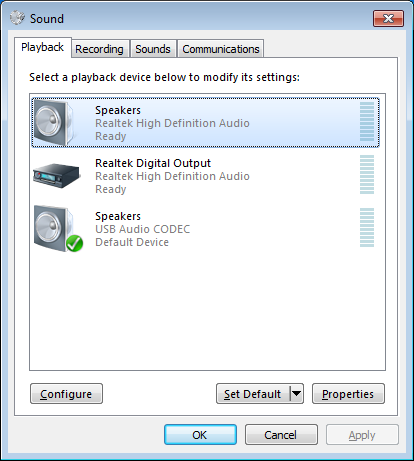 Click the main sound card device. Clicking Set Default will set the selected device as the Default (sound) Device and Default Communication Device. Clicking the down arrow will display the options set as default. Click the radio interface device. Set the Speakers level to 50. Setting the audio level half-way will prevent distortion and clipping of the audio signal. Further audio level adjustments should be made using the level controls on the interface device. 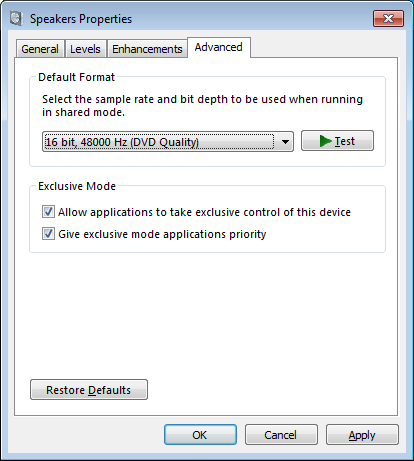 A range up to 75 appears to be acceptable in Windows, however change this setting last. 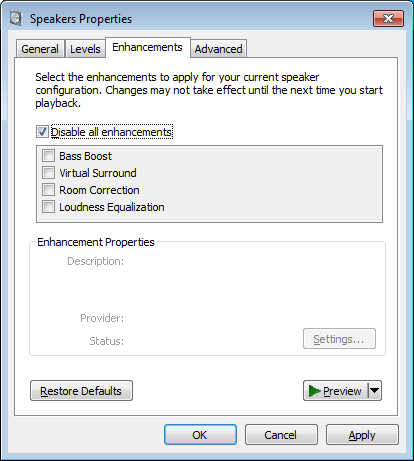 Disabling enhancements eliminates a possible source of distortion in the audio signal. Distortions will result in undesired or no decoding of the data. Under Default Format, select 16 bit, 48000 Hz. 41000 Hz is fine for many applications. Some digital modulation requires more bandwidth.